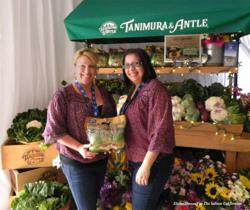 For the sixth straight year, local family-owned produce company, Tanimura & Antle sponsored the Lexus Grand Tasting event at the annual Pebble Beach Food and Wine April 6 and 7th. Each year, Tanimura & Antle has used this opportunity to showcase their locally grown fresh produce to both visitors and local attendees of this annual culinary event, capturing new foodie fans each year! “We have been a sponsor of the Pebble Beach Food and Wine for the past six years, it is our pleasure to participate in this annual event and showcase our fresh produce in this unique culinary setting,” Diana McClean, Director of Marketing. For the sixth straight year, produce industry leader, Tanimura & Antle sponsored the Lexus Grand Tasting event at the annual Pebble Beach Food and Wine April 6 and 7th. Each year, Tanimura & Antle has used this opportunity to showcase their locally grown fresh produce to both visitors and local attendees of this annual culinary event, capturing new foodie fans each year! As in past years, Tanimura & Antle gave away samples of fresh product. This year it was their newest product, Little Gems™ Sweet Lettuce. “We have been a sponsor of the Pebble Beach Food and Wine for the past six years, it is our pleasure to participate in this annual event and showcase our fresh produce in this unique culinary setting,” comments Diana McClean, Director of Marketing. Tanimura & Antle supports the ongoing efforts of this annual prestigious event that benefits several local non-profits. Tanimura & Antle is an industry leader whose commitment to premium quality produce has remained strong since its formation in 1982. The Tanimura & Antle families combined more than 50 years of experience and knowledge to establish a produce company unrivaled in its quality products, innovation and dedication to growers, customers, consumers and employees. Today, as one of the largest independent lettuce growers in the United States, Tanimura & Antle farms more than 30,000 acres of rich, fertile farmland and ships a full line of premium fresh produce products throughout North America, Europe and Asia. For more information, please visit http://www.taproduce.com. Pebble Beach Food & Wine is considered to be the Premier Epicurean Lifestyle Event in the Country. Hosted on one of the most pristine strips of coastline in the world, Pebble Beach Food & Wine celebrates sixty celebrity chefs and two hundred and fifty wineries during this unforgettable four-day event. Pebble Beach Food & Wine brings internationally acclaimed wineries and chefs together with California regional superstars to create an unbelievable series of luxurious luncheons, delectable dinners, cooking demonstrations, wine tastings, and one of the most decadent grand tastings in the country. Please visit http://www.PebbleBeachFoodandWine.com for event information, ticket purchases and accommodation information today!